Fractures of the Low Back (Lumbar Spine) due to Bone Thinning (Osteoporosis) are a common occurrence, especially in elderly patients. These types of fractures can result from relatively minor events such as a sudden sneeze or cough, bending over, or minor falls. Lets take a quick look at the normal Anatomy of the low back. The Image below shows a blow-up of a section of our Low Back. The whole body Color MRI on the left helps to orient us to where the blow-up originates. 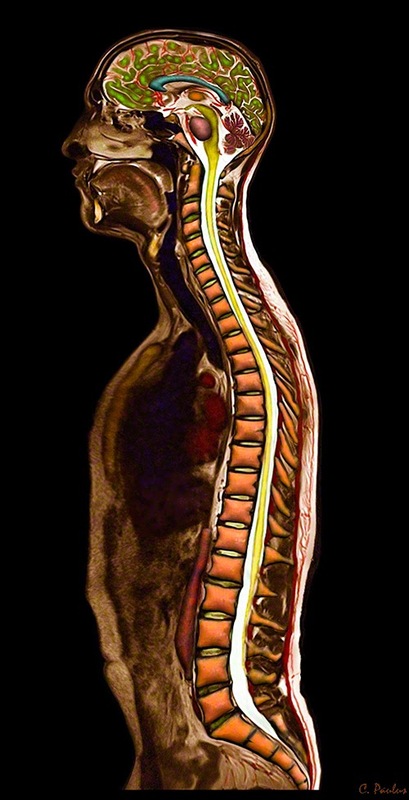 The Vertebrae (orange-brown) are shown separated by the Spinal Discs (green). The square shape part of the Vertebra is called the "Vertebral Body". It is the largest part of a Vertebra and is located in the front of the Spine. 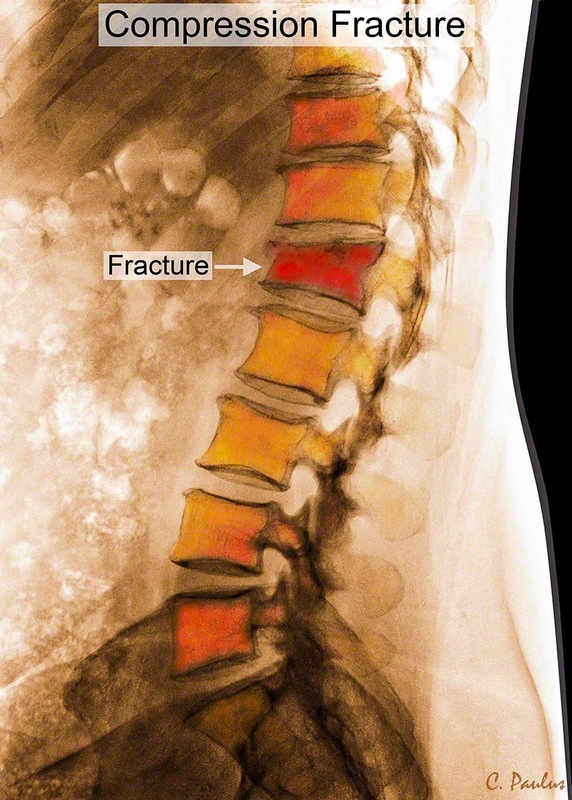 It is this Vertebral Body which is prone to fracture in a Compression Fracture. Behind the Body of the Vertebra you can see the Spinal Fluid (blue) which bathes the Spinal Cord and Spinal Nerves (yellow). 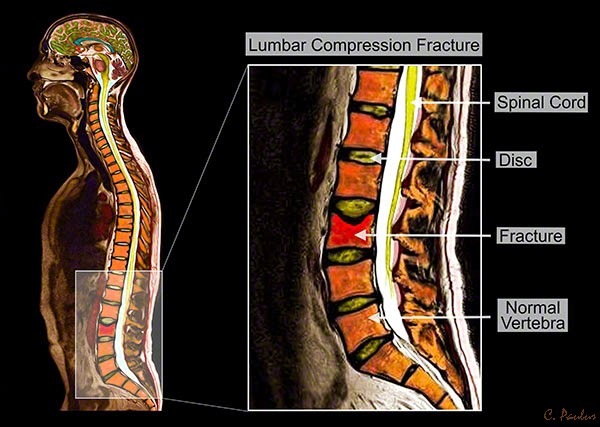 The Color MRI Image below shows a Compression Fracture in red. Notice how the top of the Body of the Vertebra has collapsed. 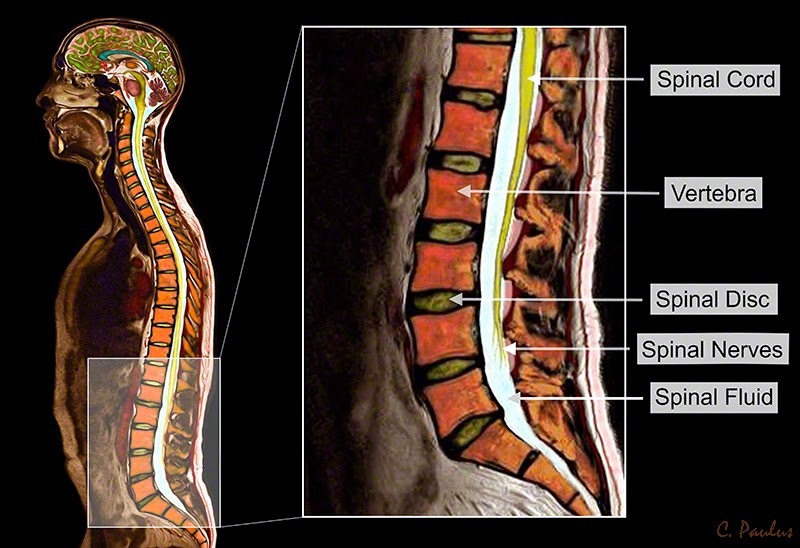 The next Color MRI Image offers a side-by-side comparison of a Normal and a Fractured Vertebra. "pie-shaped". 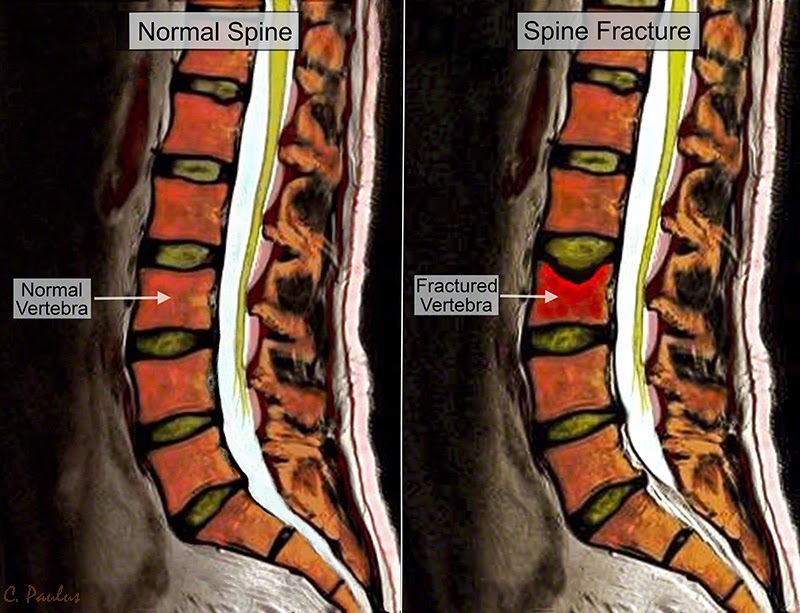 This type of compression fracture can change the Spinal Curvature, causing a more stooped appearance. 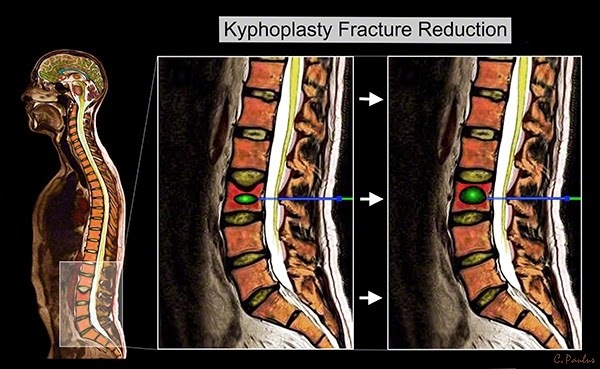 The last Color MRI Image below shows one type of treatment for Compression Fractures, called a Kyphoplasty. A powerful balloon (green) is placed through a small metal straw (blue) into the fractured Vertebra. Once properly positioned, the balloon is inflated. This can help in some cases to restore the original semi-square shape of the Fractured Vertebra. Color X-Ray and Color MRI Image like the ones shown in this Blog are available for licensing at www.medicalmediaimages.com. The above text and Images are Copyright Medical Media Images.